Slightly larger than the plucky Santa Fe Sport, the Santa Fe speaks to those with bigger needs for family, friends and occasionally a few toys towed behind. More powerful and less expensive than its competition, the Santa Fe pleases with its luxury-car good looks and long list of cutting-edge technology both in the cabin and under the hood. My Hyundai Santa Fe Sport is Luxury and Affordability. I love most everything about my vehicle. It's a smaller mid-size suv that is spacious. The sound quality of my speakers is excellent. The touch screen & Bluetooth are both convenient. I love the push-button start option along with the light in my side mirrors that alerts me when another car is passing. The backup camera is a life saver, as it beeps if anything is in or very close to my path. 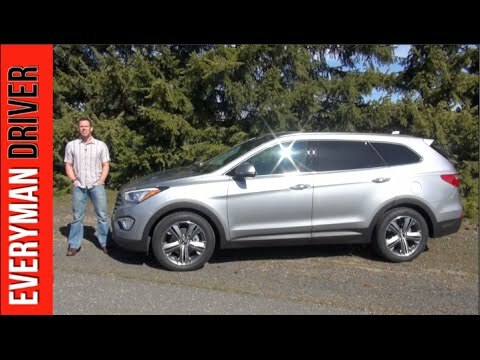 My Hyundai Santa Fe Sport is both luxury and affordability. My only issue is with the paint. It chipped after a car wash. I don't know if it was something to do with the automatic car wash or the quality of paint. It does have a paint warranty until 30,000 miles, but mine was over that. It's an inconvenience, but I will have it repainted. I am still very happy with my purchase. For a smooth and affordable drive look no further than a Hyundai Santa Fe. The car has been very dependable although the gas mileage is relatively low at approximately 20 miles per gallon. The car drives very smoothly and handles well in rain and snow conditions. The only problem I have with the car so far, is the gas tank sensor recently failed and wouldn't gauge the gas level correctly nor allow more than 5 gallons to be pumped at a time. The gas sensor has been fixed and functioning properly. It's not equipped with a ton of bells and whistles, just your standard power locks and windows. I would highly recommend a Hyundai Santa Fe as a a nice and dependable drive at an affordable price. Very dependable car. Lots of cup holders which I use all the time. It is a very smooth ride. Easy to handle. Plenty of room for 4 people. Ac and radio work very well. I would like a sun roof. It is much lower than my old car so I would prefer to be a little higher. I do like the sporty look. No major issues that have had to be fixed. However one door lock broke and there was no cost to fix and the service people are really great to work with on issues. Plenty of legroom for taller people. so far has been a very dependable car to drive. The get up and go is good to get on highway and the highway ride is nice. Gas mileage has been really good.